It will be the first time little cube-shaped satellites, CubeSats as they're known, set sail for deep space. The journey will span 6 1/2 months and 300 million miles. Once free from the rocket's upper stage following liftoff, WALL-E and EVE will trail a few thousand miles behind InSight en route to Mars. The two mini spacecraft will also be a few thousand milesapart from one another. That's to prevent any collisions or even close calls. While that may seem far apart, it's actually fairly close by space standards, according to Brian Clement, an engineer on the project at NASA's Jet Propulsion Laboratory in Pasadena, California. While InSight will be stopping at Mars on Nov. 26, WALL-E and EVE will zoom past the planet from about 2,200 miles out. Called MarCO-A and MarCO-B, the tiny machines have already passed the first important milestone in their groundbreaking mission to the Red Planet. When MarCO-A and MarCO-B arrive at Mars later this year, they’ll be the smallest machines to ever visit another planet. Known as nanosatellites, these devices weigh a mere 30 pounds each, and measure just 14.4 inches by 9.5 inches by 4.6 inches when packed into a rocket’s cargo hold. 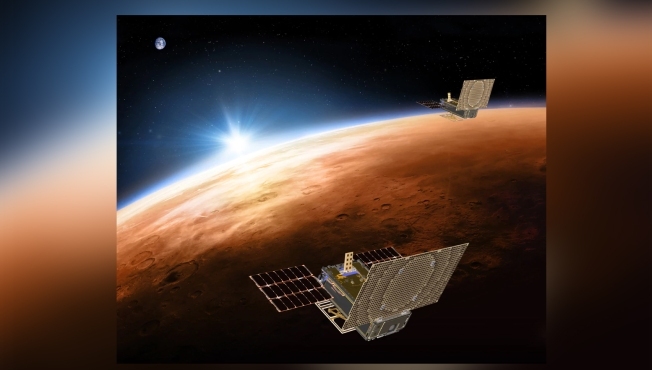 Once at Mars, the tiny satellites will provide a communications link with stations on Earth as InSight makes its perilous entry to the surface. The goal of the CubeSats is a proof-of-concept mission to test the viability of sending small satellites to the outer reaches of the Solar System. NASA scientists are using the mission to understand if and how CubeSats can work in deep space, testing their endurance and navigational abilities. Should all go well, NASA can start to think about similar missions to other Solar System bodies, such as the outer gas planets and possibly even the Kuiper Belt. Solar will not work out there thou as that will require nuclear powered systems to make it a possibility. The heatshield on this was changed out as it had cracked in testing but for mars the lander is still gots its chances that it still could fail to land. NASA makes flying to Mars look easy, but cross your fingers for InSight anyway; Newest spacecraft will burrow into Mars, but it must first get there safely. The InSight lander builds on the design of NASA's Mars Phoenix lander, which touched down in 2008. It will use a combination of parachutes and then 12 descent engines to slow from an atmospheric entry velocity of 6.3km/second. After landing, InSight will spend about two months slowly deploying and testing its 2.4-meter robotic arm and scientific instruments. It will then begin its science activities. The heat probe is scheduled to deploy and begin burrowing into the Martian soil about 17 weeks after landing. The prime mission is scheduled to last about two years. The seismometer itself worked fine, but several times during 2015, engineers found a leak in the 22cm sphere that creates a vacuum so that the instrument can function on the harsh surface of Mars. Their temporary fixes didn't address the problem. NASA now says the problem has been fixed. The fact that Nasa has made the last eight rovers, landers, and orbiters it has sent to Mars and we take for granted that everything on a mission like this will work. In another topic, kbd512 pointed out that in scouting out potential landing sites for C130 aircraft in unprepared terrain, it was occasionally appropriate to send individuals to the potential site to pound stakes into the soil as a way of collecting data about the soil (to characterize the soil). The Insight lander will use an electric hammer (as described earlier in this topic) to deliver a probe to a point below the surface. What is NOT clear (to me) at this point, is whether the Insight engineering team will be collecting data about the soil the probe will be entering, AND if that data will be provided to potential landing site planners. Nasa has set up a primitive AI system at Ask NASA Mars. It is not a shining example of anywhere near Alexa level, for sure. ROV-E: If you were asking: Thanks, the answer is: You're welcome! What I'm hoping is that questions ROVE-E cannot answer will be reviewed by a member of the Insight Team. I've invited them to open a membership on the NewMars.com forum, to facilitate immediate communication with members of this community. Then, maybe, we shall have to avoid mentioning NASAs shortcomings so as to prevent its engineers from being banned from using this site by NASA management or their political masters. I hope that both Spacex and NASA people visit this site. They will find good questions being asked, and some good ideas. I could not agree more and remember back when Hubble need to be rescued and shuttle needed a second shuttle or safe haven to be used. I had email the then director with a concept to use the return portion of a soyuz in the shuttle bay as a safe haven return if the shuttle had been damage while going to the hubble to make its repairs. It was presented to a tiger team as an option but back then we were not making use of them for flights to the station so they were not likely to lend one for the purpose. MarCO-A and MarCO-B but nicknamed "EVE" and "Wall-E" by their engineering team. Its been quite a period of time since launch but we are getting closer to a landing on mars. NASA's InSight Mars Lander Touches Down 1 Week from Today! NASA's spent $850 million to make the InSight lander mission possible. Of course this will all need to change as we go up in payloads to the surface. 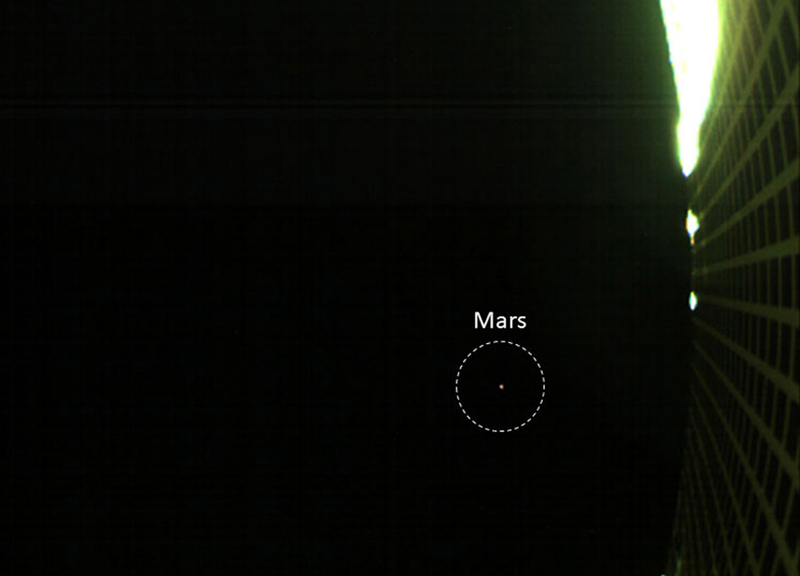 Title is a great question Red Planet InSight: Why Do We Keep Going Back to Mars? Humanity has gazed at Mars for centuries, dreaming of what might lie on its dust-orange surface. As our telescopes improved, so did our picture of the Red Planet, though scientists' interpretation of that growing detail has not always been accurate. More recently, scientists have found evidence of a warmer, wetter ancient past for the planet that could have hosted Earth-like life, and so the search for life continues, though it now stretches to the past. NASA's InSight Mars mission, set to touch down on Monday (Nov. 26), will delve deeper below the planet's surface than any mission before it, learning about the planet's interior. Sure would be nice to be there rather than a robotic mission. Congrats on the hard work and due diligence of your teams. As usual, fantastic job! I am finding this a very boring mission to be honest. It's going to tell us things that we will find out (but in much greater depth) via Space X within the next 6 years minimum or 8 years max. But if Space X weren't going there the info would be pretty meaningless really. Why do we need a robot mission to tell us about seismic data if we are only going to send more robot missions, as NASA plans? I always make the point that in the first two years of a Space X mission to Mars we will have learnt more about Mars than in the last 50 years and, we will also have learned more than another 50 years of robot missions could tell us. The problem with the Space X mission to Mars will not be "will it make any great discoveries?" but "how the hell do we analyse all this data?". Musk is planning to take 500 tonnes of cargo to Mars - which must be about 200 x more than all the previous missions to the Mars surface. Puts it into perspective doesn't it? First image. Lens cap is still on, covered in dust and debris from landing. They will discard the lens cap later. I am finding this a very boring mission to be honest. I attended the Lunar and Planetary Science Conference in 2005. Primary investigators for all NASA interplanetary missions were there, presenting results. So where primary investigators for European Space Agency and Russian Space Agency. It made my head hurt. Difficult keeping up. But the geology track was different. There was one discussion of whether the core of Mars is still molten. The professional geologists, all with Ph.D.'s in their field, literally yelled at each other, calling each other idiots. Looked like an episode from "The Big Bang Theory". My conclusion is we don't have enough data. They're making guesses based on insufficient data. I criticize both sides of that argument for lack of professionalism. The point of InSight is to answer that question. This should answer whether Mars is still active. Does it have a molten core? Is the core partially molten but not fully molten as some geologists think? Is there still geothermal heat that we can use for settlement on Mars? Is there sufficient heat to melt underground ice forming a liquid aquifer? Nature of the core could be critical to creating an artificial planetary magnetosphere. A lot of useful science. Or you could have fun with it. InSight will place a thumper on the surface. On a desert planet. Just hope there's no giant sand worm. I obviously like all Mars missions but this does seem a bit pedestrian. We'd know the answer to all these questions within two weeks of landing humans on Mars. We shouldn't be settling these beefs between planetary scientists with hundreds of million of dollars in such an inefficient and expensive manner. Siemic data can tell us if the planets core is solid or still molten for creating a great magnetic field for the purpose of gravity and a greater megasphere for atmospheric protection loss. Seismic can also be used to detect voids in the area if there are tremors. It can be used to detect meteor strikes. The heat probe also is being used to tell if the core is molten and if there is any density changes with depth. From a near frozen crust to possible water table that is liquid below the surface. InSight enters the atmosphere at a lower velocity -- 12,300 miles per hour (5.5 kilometers per second) vs. 12,500 miles per hour (5.6 kilometers per second) as seen with the Pheonix lander. InSight lander pulled off a blazing six-and-a-half minute 77-mile plunge to the surface of Mars Monday, using a huge parachute and then 12 pulsing rocket thrusters to settle to a gentle 5-mph touchdown. InSight's protective heat shield endured temperatures up to 2,700 degrees Fahrenheit, the vehicle "felt" an atmospheric braking force of 7.5 times the force of gravity on Earth and still more as its 39-foot-wide supersonic parachute inflated with a force of 12,500 pounds per square foot. "Once InSight slows to about 400 meters per second (895 mph), it will deploy its 12-meter diameter supersonic parachute. The parachute will deploy, nominally, at about Mach 1.7. Long before the MRO could relay data back from the landers return signal 3hrs later that it had landed safely the cube sat's had done so. MarCOs, the flight control team already knew the lander had made it safely to the surface, albeit 8.1 minutes after the fact. That's how long it took for radio signals from Mars to cross the 90-million-mile gulf to Earth. Let me put this in terms the SpaceX faithful might understand. NASA needs to figure out where the water is located so that when SpaceX sends rockets to Mars, it's not a one-way trip. As of right now, the only people who have reliably sent a ton of anything to the surface of Mars are from NASA and JPL. The only reason SpaceX, or anyone else for that matter, knows bean dip about Mars is that NASA and JPL have devoted enormous effort to successfully landing on Mars. They hand out whatever they learn to anyone with enough good sense to learn from it. NASA and JPL have collected, analyzed, and distributed more data on Mars than Musk or anyone else ever has, period, full stop, and end of story. SpaceX has yet to send anyone into space. We should consider all the other issues with them sending a human to Mars the moment after that small feat has been accomplished. The only place they've ever landed anything is on Earth. They have a rocket and a Dragon capsule they could send to Mars if they decided to do it, but people with more hubris than common sense think they're going to go directly from having never landed anything on Mars, even once, to landing something larger than the Space Shuttle with no intermediate steps. If it works, then great. I wish those people lots of good luck, because without good data they'll surely need it. I'll just insert my 2 cents worth of bean dip here. I agree that what NASA has accomplished is nothing short of miraculous, and is the ONLY space agency to land a probe and get back any data. But I think Louis' point about manned missions is also salient; many of these probes have been doing interesting but of the mark science as far as human space travel is concerned. Yes, we want and need boots on Mars, and that we're reaching a point of diminishing returns with additional non-human mission directed robotic probes. I can see maybe 2 more landers, so make them count about finding definitive liquid water or source of relatively clean and pure ice. Yes, we need to send humans. But I believe InSight is a good mission. Mars 2020 is not. We need a robotic Mars sample return mission as a technology demonstrator for ISPP. Entirely self-contained, which will collect samples, produce propellant, and send the sample back to Earth in a capsule the same as Genesis or Stardust. Lunar Gateway is a colossal waste of money and just stupid. I've listed before what we need. However, InSight is a good mission. You're betting against SpaceX? Bet away, plenty of people have in the past. I don't deny Space X are standing on the shoulders of giants but NASA are brushing the dandruff off the shoulders of giants. I really support this Robert. Best to know what humans will be standing on. Is there water to be had, and where. Closer to the equator in general seems a better deal to me. I think SpaceX is wonderful, they have narrow plans of technology breakthroughs, and if you look very broad plans beyond that. But there are in my opinion 3 general things to look into for Mars. 1) Exobiology, 2) General Science, 3) Actively with motion, placing humans on Mars to thrive, ideally. Science and Technology overlap, and need each other, but they are more independent spheres of activity which are ideally complementary in their blossoming. Knowing better what is inside of Mars is indeed very important for everything. ROSCOSMOS was actually the first space agency to send a probe to the surface of Mars, but it lasted for mere seconds before it stopped transmitting. Apart from that, their track record with Mars probes has been abysmal. Admittedly, most of that was problems with everything but the probe itself. However, absolutely everything has to function correctly to pull off a landing. In contrast, their Venus exploration campaign has been substantially more successful. NASA is the only space agency to ever send probes and rovers to the surface of Mars and return meaningful data back to Earth. ESA has sent probes that successfully landed, which is no small feat, but those probes failed to transmit once on the surface. I sincerely doubt that anyone is going to Mars reliably without a lot of help from NASA and JPL. The agency is more than happy to share what they've learned with other space agencies and private corporations like SpaceX. That said, sound design principles and copying success are the best ways to achieve successful mission outcomes. I'm betting that you need to send someone into space before you can even think about sending them to Mars. I'm betting that you need to know where a good source of water is located on Mars if you must make propellant to return the astronauts you send to Mars back to Earth by using that water, or just the rocket if you don't care about the astronauts. I'm affirming that I've seen no patents indicating that SpaceX has done any work on a LOX/LCH4 plant. The absence of patents is not an indication that such technology doesn't exist, but virtually all government agencies and private corporations that wish to retain intellectual property for their own use file patents with our patent office. So far as I can tell, the only meaningful work on that technology comes from NASA and their contractors or affiliated university programs. The enabling solar and nuclear power technologies to provide reliable power without excessive weight come from NASA and their contractors. Each and every time you attempt to ignore or besmirch the achievements and contributions of NASA to Mars exploration, the more and more you'll see NASA's name written all over the technologies that enable space exploration. SpaceX's development and implementation of reusable rockets is an accomplishment that deserves high praise, and I have given them full credit for that incredible achievement. However, virtually every key technology required to live on Mars comes from NASA and their contractors. The transportation solution (reusable rockets) is a baseline requirement for sending humans to Mars. After that, everything else comes into play (reliable power, reliable long duration life support, the ability to obtain oxygen and water from Mars, the ability to grow food, the ability to make propellants, the ability to keep humans healthy in space for several years). That's where public space agencies from the US and Canada, European Union, Russia, and India are required. I wish every effort to go to Mars nothing but the best, whether it comes from NASA, ESA, ROSCOSMOS, SpaceX, or anyone else. I also think there's a logical progression of activities that lead up to sending humans somewhere besides Earth. The first step is to study the place you want to go. The second step is for America to restore its human space flight capabilities. The third step is to prove the ability to live in deep space for at least as long as it takes to get to where you want to go. The final step is actually going to the place you want to go to. It seems like you want to skip over all those intermediate steps and that's not a recipe for success if past experience is any indicator.